Union Minister of Agriculture and Farmers’ Welfare Radha Mohan Singh has said that government is committed to doubling farmers’ income by 2022 by providing greater access to rural milk producers by strengthening dairy infrastructure in order to help generate year round income and gainful employment. Speaking on “Milk Processing Infrastructure in Dairy Cooperative Sector” at the Inter-Session Meeting of Consultative Committee of the Ministry of Agriculture & Farmers’ Welfare yesterday, he said that the government is making efforts to strengthen infrastructure for production of quality milk, procurement, processing and marketing of milk and milk products through various Dairy Development Schemes namely National Programme for Dairy Development (NPDD), National Dairy Plan Phase-I (NDP-I) and Dairy Entrepreneurship Development Scheme (DEDS). Further, Dairy Processing & Infrastructure Development Fund (DIDF) has been set up with a corpus of Rs 8004 crore for setting up of chilling infrastructure & installation of electronic milk adulteration testing equipment at village level and creation/ modernisation/ expansion of processing infrastructure and manufacturing facilities for Value Added Products. Singh said that on January 22, 2019, 22 sub-projects have been approved with total estimated project cost of Rs. 3147.22 crore in five States namely Punjab, Haryana, Gujarat, Karnataka and Maharashtra. He informed that new schemes with soft loans from World Bank and Japan International Corporation Agency (JICA) are being finalized for extending the benefits to wider number of farmers. The Minister informed that the government is also formulating plans for creation of dairy infrastructure besides implementing the ongoing schemes for dairy development. The National Action Plan (NAP) for Dairy Development envisages increasing milk production to 254.5 Million MT by 2021-22 requiring an annual growth rate of 8.56% which would lead to increase in per capita availability of milk to 515 grams per day by 2021-22 addressing the nutritional requirement of the growing population. He added that to do this, it has been targeted to increase the organised milk handling from present 21% to 41% by March 2022 while increasing cooperative share from present 10% to 20%. Singh disclosed that as a result of prudent policy intervention, India ranks first among the world’s milk producing nations, achieving an annual production of 176.35 million tonnes during 2017-18 with an annual growth rate of 6.62%. The per capita availability of milk has reached a level of 375 grams per day during 2017-18, which is more than the world average of around 294.2 grams per day. 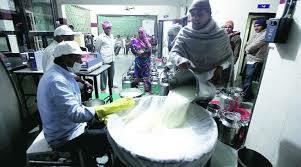 Growth in milk production is 23.8% during 2014-18 as compared to 2010-14.